The papillon is a toy dog breed named after the word "butterfly" in French due to the breed's large upright ears resembling the wings of a butterfly. The breed is considered a companion breed, but papillons don't necessarily make the best lap dogs. 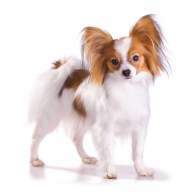 Like many other toy dog breeds, papillons think they're much bigger dogs than they really are. The breed is alert and makes a good watchdog and can also rid your home of small vermin. 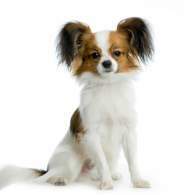 Papillons can be described as a happy intelligent dog breed which are friendly to guests and children. There is no doubt that when you first see one of these dogs in person, the cuteness factor is going to obscure any Papillon facts you may know. While these dogs can be excellent companions, there are many things to consider before you are overwhelmed with how truly adorable they are. They are typically good as first dogs, but families that have other pets — especially larger dogs — should understand the issues that can arise. Mature children should not be a concern, but very young kids may pose problems. Papillons are great for apartment living, and they are not outside dogs in case you have a large, rural home with lots of yard space. The papillon is a small, but sturdy dog. They generally only weigh 4-9 pounds and are less than a foot tall as adults, so the breed will need to be supervised when around children or playing with larger dogs to make sure they don't get injured. Their small size makes them easy to care for, but unlike other smaller dog breeds the papillon is not a lap dog and isn't too fond of cuddling. Papillons are friendly dogs that should never be aggressive or shy. They are, however, bold and can be bossy towards other pets (as they are a big dog in a small dog's body), but this shouldn't be mistaken for aggression. The breed is intelligent which makes them easy to train. The papillon has a long, silky, straight coat which lacks an undercoat. 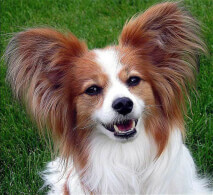 They have large ears which resemble butterfly wings (papillon is French for "butterfly") and a fluffy tail which is carried over the back of the dog. Papillons have high amounts of energy and will require 2-3 walks per day to meet their exercise requirements. Even though the breed has a long coat, it requires surprisingly little care. Papillons don't develop a dog odor and their coat doesn't tangle easily, so brushing the coat once to twice a week and bathing as needed are all the coat needs to be well maintained. Papillon history is as rich as the dog's ears are fascinating — if not more so. Art depicting these dogs have been found from as far back as the 14th century, and a number of Renaissance masters such as Boucher, Rubens, and Watteau have featured the breed in their works. In 1870, a particularly famous painting by Renoir, "Head of a Dog," was produced. European royalty was known to have owned these dogs, and one was believed to have been carried by France's Marie Antoinette when she was led to the guillotine. Despite the dog's popularity in centuries past, the origins of the Papillon is unclear. There are those who claim the dog ultimate came from the Japanese Chin. Some say it was Belgium, others claim it was France and still others declare Spain was the place these terriers were first known. Likewise, there are many names that this dog has been called: Dwarf Spaniels, Epagneuls Nain, Little Squirrel Dog and Belgian Toy Spaniel are but a few of them. 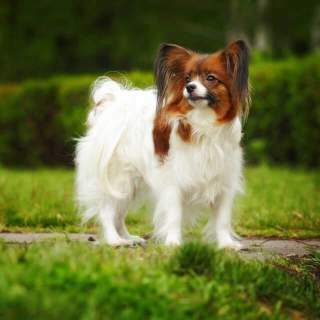 Although European kennel clubs — such as the FCI — recognizes just one breed (under a different name), the club lists two varieties under it: Papillons from Phalenes. The AKC, which first listed the breed in 1915, only recognizes one breed and has Papillons and Phalenes under "Papillon." (In French, "papillon" means "butterfly" and "phalène" means "moth," which is used to describe the dog's floppy, fallen ears.) The Kennel Club (in England) recognized the breed a few years later in 1923, and the FCI accepted the breed in 1954. In 1935, the Papillon Club of America was founded, and the members were detailed in maintaining Papillon dog history. Although it dissolved in 1943, it was revived in 1948 and continues to this day. These days, the Papillon is very popular, and there is apparently a U.S.-based campaign to distinguish Papillons from Phalenes. The Papillon is a small, proud and spritely dog whose fine bone structure, ears and tail all lend to a graceful, elegant, almost floating presence. These dogs tend to have an alert expression without appearing alarmed. Their eyes are medium in size, somewhat intent in their gaze, and set in a small head. The ears may be erect or may drop forward. (In some countries, regions and kennel club jurisdictions, the ears determine varieties; under the AKC, both the "butterfly" ear Papillon and the drop eared Papillon are considered a single breed.) They have a strong, proud chest that juts forward in a challenging fashion. Unlike most similar small dogs, the Papillon has long feet that are termed "hare feet," and a fair portion rests on the ground like those of a rabbit. The tail is medium in length, held high and plumed, and it will balance the ears nicely. The Papillon coat is a single layer of fine, long silky hair and comes in a wide range of colors, all of which are described elsewhere on this page. The Papillon comes in a great many colors. Most of these dogs are tricolored and many are parti colored. It is rare to find a black Papillon, as cute as they may be. Solid color Papillons are well outside the breed standards by which most breeders closely follow. You'll be more likely to find a black and white Papillon or a white Papillon with very light coloring or patches. You should also know that the color of a Papillon puppy will change as the dog matures. You may be shown a red Papillon puppy, but by the time the dog is anywhere from 6 to 8 months old, he may look very different. The Papillon size can be deceiving; they are small dogs that are far more fragile than most dogs their size. 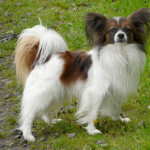 The long hair may make them seem larger, and along with their light bone structure, the typical Papillon weight can seem much more than it really is. A Papillon full grown will usually weigh about 9 or 10 pounds, and they will stand from 8 to 11 inches. Because they are highly sought and becoming ever more popular, it is not too unusual to find much Papillons smaller than even 8 inches high or less than 9 pounds. Understanding the variations of the Papillon can be confusing. The dog goes under different names in different regions. 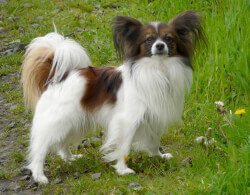 If you see them called a Squirrel Dog or a Continental Toy Spaniel, it is not a variety, crossbreed or anything different; it's still a Papillon. Also, some kennel clubs consider the varieties as separate breeds while other clubs consider both varieties as a single breed. For the most part, however, there are basically two varieties: the Papillon and the Phalene. 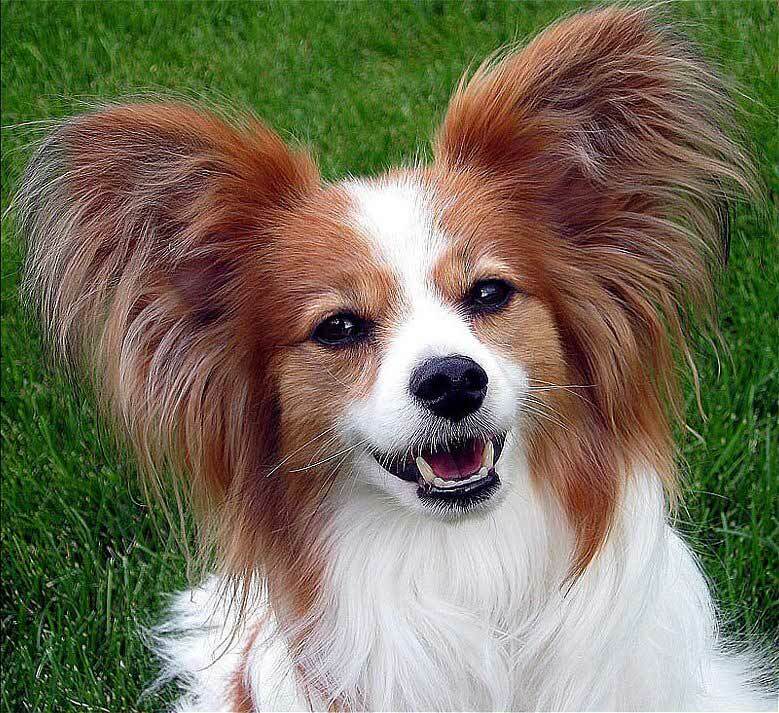 The Papillon has fully erect ears which give the dog's face a distinct butterfly appearance. The Phalene, which in French means "night moth," has ears that drop forward. Both dogs can be found in a single litter and will otherwise look the same. 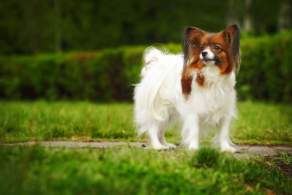 Although there is no formal type of big Papillon or teacup Papillon, there are breeders who will call this dog names based on the size they sell. You may even find some that are called a toy Papillon, but you should know that all Papillons are in the Toy Dog Group. It is typical to have a single litter with Papillons that, once fully grown, can vary widely in their size and weight. The Papillon temperament tends to be an amicable one. They can be high-strung, however, but for the most part, they are very friendly with kids, other dogs, and friends who are gentle when they meet. These dogs don't bark a lot (unless they are anxious). While they do like to be lapdogs, they are typically very active. As these dogs are intelligent and somewhat independently minded, their extreme cuteness factor should not be always indulged. They will want to explore as they please, at times, and they may prefer to be left alone even as they remain nearby as you move about. They are not normally shy or overly aggressive. If they are, these are Papillon traits that should be resolved. Training may be difficult, and you will need a lot of patience. The Papillon personality is one that has a centuries-old history of being pampered, and it's in their nature to do what they want. House breaking, socialization (especially with larger dogs, which they will almost certainly challenge every chance they get) and understanding that they are a good watchdog but not a guard dog are some of the things that they must learn. Your Papillon may deal relatively well with kids, but it depends on a lot of factors: the age of the kids, the level of noise, and the amount of time they spend together are but a few of these factors. With mature kids who aren't noisy and a Papillon that has a place to get away from any commotion, things should be fine. With very young kids, constant rambunctiousness or nowhere to go, your Papillon can quickly and easily get distressed, anxious and aggressive. The second leading cause of death for Papillons is said to be trauma — and many of those cases happen at home. Children playing roughly, dropping them or prompting the dogs to leap from their insistent grips are, sadly, frequent enough occurrences. Your Papillon will most likely get along with other dogs and most non-canine pets. Typical, the best combination is a Papillon and cats or other small (or smaller) dogs. Papillons have a fragile bone structure, however, so overly aggressive cats, larger dogs that play roughly and any pets that may be aggressive toward these little dogs should be closely supervised or carefully socialized. Any pets that may view your Papillon as prey should certainly be kept away. 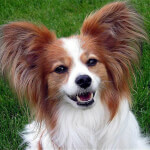 Below are pictures of the Papillon dog breed. Separation anxiety may or may not be an issue with Papillons. Some of them may want to follow you closely but not want to be handled or picked up. Some may not like being alone at all. As for their behavior regarding strangers or new friends, they may be aloof, or they may bark until they feel comfortable. These dogs are not known for being frequent barkers, however, unless they are very upset. Small apartments and homes without cat doors are best for owning a Papillon. Perhaps the biggest problem is the speed with which these dogs can escape through a seemingly small hole, door crack or other previously unnoticed exit. Just as they can suddenly be underfoot, so too can they just as quickly be gone in the few seconds a door is left open and unguarded. Once the cute factor shock has worn off, most people may then ask, Are Papillons hypoallergenic? They are not, and they do shed a moderate amount. They are somewhat easy to groom, however, yet they may leave a lot of hair in places that for you are hard to reach. The Papillon is a dog that has fewer health concerns than most dog breeds. They tend to live longer, but there are problems that can occur due to their fine bone structures. Very small Papillons that are impregnated can have extremely serious birthing problems. You should sure to only adopt a Papillon that comes from a breeder who gets all the basic health tests and vet certifications. The average lifespan for a Papillon is 13 to 16 years.